Eagle's Brook (otherwise called Eagle Brook) is a minor township that contains the many artisans and craftsmen that serve the nobility of Camlorn, which overlooks the entirety of the Cambray Hills. Eagle's Brook primarily serves as a gateway between the city-state of Camlorn and the Eltheric Ocean, opening trade along the northern route. Eagle's Brook is known for also harvesting seafood daily. Earthtear Caverns (or Earthtear Cavern) is a network of underground tunnels and chasms in the Craglorn region of Hammerfell. At least two entrances exist: one just northeast of Azra's Crossing, and another in the desert far west of Belkarth. Like all natural caves, these tunnels once served as the capillaries of Nirn, pulsing with the divine essence of the Aedra. Some of the larger caverns are open to the sky and partially flooded. The ancient Nedes were the original occupants of the caverns, although the Nedic complex was later occupied by the Yokudans after their invasion of Tamriel in 1E 808. As such, the architecture has significant Redguard influence. The complex was later abandoned and fell into ruin. Circa 2E 582, the Nedic ruins at Earthtear Caverns were available for purchase as a private lair. During the War of the Bend'r-mahk, the invading forces of Skyrim used the caverns as a meeting point. However, one of their numbers was attacked within by Pergan Asuul, who summoned vermin to overrun the caverns. Namely, Earthtear became host to rats, spiders, and wormmouths, including a giant Diamond Spider Queen. In 3E 397, the Soul of Conflict entered Earthtear to clear it of vermin so that Skelos Undriel could use it as a hiding place. Safe from the agents of Jagar Tharn, Undriel then used the caverns as a base in his quest to assemble the Star Teeth. Asuul also created a Shadowgate within the caves, sealing off a section. With his permission, the Soul of Conflict dissipated this barrier and killed the undead guardians within. The Ebon Crypt is an ancient mausoleum found in the region of Glenumbra, within the province of High Rock. It is the ancestral tomb of the Gautier family, a noble clan from the city-state of Camlorn. The village of Ebon Wastes had its name derive from the landmark of the Ebon Crypt. Ebon Stadmont is a forest located on the base of Eton Nir, in the province of the Summerset Isles. Ebon Stadmont is a location shrouded in mystery, the source of various legends and myths found throughout the Summerset Isle. Ebon Stadmont's tablets and ruins are covered in an unknown and mysterious language, one that is said to be similar to that of the Daedra, with lines of text on structures with statues of crows—a creature associated with Nocturnal. Ebrocca was one of the youngest ruins in the Shivering Isles at the end of the Third Era, when it was almost 1,000 years old. It was located near the settlement of Highcross. The ruins were purged of undead in 3E 433 by Sheogorath's Champion. The history of Ebrocca is quite interesting. Apparently Ardwe Malifant, the clanfather of a Bosmer family, built it as a final resting place for his deceased mother. However, his mother's death must have driven him into insanity, because he built it in the Shivering Isles instead of Skyrim, where his family had expected it. The site was built to last, with numerous security systems and magics to revive the caretaker put in place. Ardwe then systematically killed off all of his relatives. Clanfather Malifant finally fell to Sheogorath's Champion in 3E 433, despite the resurrection enchantments which protected him from death. The Elden Grove, or Eldengrove, is a legendary forest known among the Bosmer as the birthplace of the sacred First Tree. This First Tree then gave life to all the forests of Tamriel. Its exact location has been a closely guarded secret, but it is known to be somewhere in western Valenwood. It was one of the places where Jagar Tharn hid a piece of the Staff of Chaos. The grove has been described as "misty" and "labyrinthian". Elden Root (or Eldenroot) is one of the eight major city-states in the province of Valenwood, serving as the largest settlement in the region of Grahtwood. Elden Root surrounds the ancient graht-oak tree known as the Elden Tree, which is said to have seeded all of Valenwood. These Elden Trees are among the oldest living beings in Tamriel, and are revered as the focal essence of the Green. Elinhir, also known as the City of Mages, is a town in eastern Hammerfell, close to the border with both Skyrim and Cyrodiil. It is located in the Craglorn region, close to the Skyrim town of Falkreath. Elinhir is the oldest surviving city in Craglorn. It was originally a Nede settlement, as evidenced by the city's tall Apex Towers. According to some legends, it was built at the impact site of a great skystone that fell from the sky. The Apex Stone of the Mage, a powerful remnant of the Nedic religion, is located beneath the city. The city was overseen by Governor Pomptinus from 1E 2820 to 1E 2852 as part of the Second Empire, during which time the city sewerworks were constructed. Before the beginning of the Second Era, Elinhir was similar to the rest of Craglorn in that it was settled mainly by those unfit for life inside the Empire, and it was constantly preyed upon by bandits and Iron Orcs. Early in the Second Era, a group of rogue mages led by Felix "Blackcaster" Augustus arrived at the city after departing from the Mages Guild and attempted to occupy the ruins of the Apex Tower. The mayor refused them, and in retaliation the mages seemingly made a deal with the Iron Orcs so that they would besiege the city. In a show of might, the mages drove the Orcs away, and subsequently signed the Apex Accord with the town's leadership. Under this agreement, the mages would protect the town for as long as the people of Elinhir provided support for the operation of their mages' academy. From these rogue mages grew the Blackcaster Mages Guild, who eventually came to rule over the city. Elinhir still served as a haven for outcasts, but was "civilized" under the strict rule of the mages. Despite being labeled as renegades by the Mages Guild, Elinhir prospered under the mages as their academy grew. This changed in 2E 582, when the constellations fell from the skies above Craglorn. An agent of the Scaled Court made a deal with the mages, offering to unlock the true power of the Nedic devices in their towers in return for the location of the Mage's Apex Stone. The Serpent subsequently corrupted the Stone and gained control of the Mage, who caused chaos in the surrounding region. Atronach guardians, who had been summoned to protect Craglorn from Molag Bal's Dark Anchors, turned rogue, and people were transformed into mindless spellfiends by the massive amounts of magicka permeating the region. The Blackcaster mages were similarly corrupted when they attempted to cast the Nedic spell. The results were horrendous, and the Blackcasters began to hunt down every mage in Elinhir to steal their magicka, killing many civilians in the process. At their nearby complex of Balamath, the guild also created Air Atronachs from the rogue elementals in an attempt to assemble a Daedric army for the Serpent. The guild's leader, Arch-Mage Yamanu-ko, was driven insane by her lust for power, and Elinhir's surviving population were forced to flee or take refuge in the city sewers. The city's problems were ultimately resolved with the death of Yamanu-ko and the cleansing of the Mage's Apex Stone. By 2E 864, the Redguards of Elinhir were noted for their Colovian fashion and taste. During the Imperial Simulacrum in the late Third Era, the city-state of Elinhir was an active settlement. At the time, it was known as the "Guardian of the West." It was ruled by Queen Fhimke-i, and it had a rivalry with Dragonstar. Elinhir was neighbored by several settlements, including Nimbel Moor to the northwest, and Stonedale to the south. Elsweyr is a province that lies on the southern coast of Tamriel, and is home to the feline Khajiit. The Khajiiti government is a confederacy held together by the Mane, which are the rarest of the various Khajiit breeds. An important part of Khajiiti culture is the Moon Sugar that is harvested in Elsweyr. Moon Sugar is said to be created by crystallised moonlight falling from the Ja'Kha-jay into the Bay of Topal on the southeastern coast. The waters are then drawn into the sugar plantations of the jungles of Tenmar, which cover much of the southern area of the province. 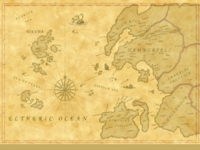 The Eltheric Ocean lies to the west of Tamriel. It meets the Padomaic Ocean in the east and encompasses the Abecean Sea, Sea of Pearls, and the Azurian Sea. It contains the major island groups of Yokuda, Thras, Pyandonea, and the Summerset Isles as well as smaller ones such as The Systres and individual islands like Herne and Cespar. Ephesus is a region in southeastern High Rock, within the Bangkorai region, to the south of the city of Evermore. It borders the Mournoth region to the north and the Fallen Wastes of Hammerfell to the south. The region contains the Pelin Graveyard and the famous Bangkorai Garrison, on the border with Hammerfell. Apart from the Garrison, access to Hammerfell is also possible through the lesser-known Sunken Road. Ephesus is also home to the ruins of Arlimahera's Grip. The Erabenimsun Camp is the home of the Erabenimsun Tribe, one of the four distinct tribes of Vvardenfell. The Erabenimsun Camp is commonly found in the region of Molag Amur. Around 2E 583, the camp was found on the base of Mount Kand, and behind the ruined city of Nchuleftingth. But by 3E 427, it was found near the shores of the Zafirbel Bay. Erokii is an ancient ruin in Rivenspire, said to have once been the greatest Ayleid city in northwest Tamriel. The great spire above Erokii, now known as the Doomcrag, has been likened to the Adamantine Tower in construction, and it has been speculated that it may, at one point, have been built as one of the Towers. It housed the Light of Life, or Lattanya in Ayleidoon, a relic which helped plants grow and healed illnesses. Following a bloody conflict between the Ayleid settlers and the original inhabitants of the area, the relic was tainted, and became Abagandra, the Lightless Remnant, a beacon of death. Errinorne Isle, also called the Veiled Isle is an island found off the coast of Auridon, in the province of the Summerset Isles. Errinorne Isle is named after House Errinorne, the ancestral royal house of Skywatch. In its time, Errinorne Island was used as a shipping and warehouse complex for the city of Skywatch, but it was later abandoned after the Sload had taken control of the island in the attempt to invade the city. The only landmark is the Veiled Keep, which is found in the center of the island. Esroniet is an island that lies somewhere between Tamriel and Akavir. It is known as the "spice island", as it is the source of much of Tamriel's nutmeg, cloves, mace, and hot peppers. The Hot Pepper Bantam Guar is native to the island, and has a spicy appearance and personality. The main port of the island is called Black Harbor. The port was captured in 3E 282 by Uriel Septim V and in 3E 284 the island's ruler, Prince Bashomon, surrendered the whole kingdom to him. Uriel transformed it into a major base for the Imperial Navy and used it as a launching point for the invasion of Akavir in 3E 288. Eton Nir is the tallest mountain found in the province of the Summerset Isles, within the Summerset Isle. Eton Nir consists of an abundance of ruins, as well as, expansive tunnel systems that connect each side of the coast. The city-state of Cloudrest is found on the highest alps of Eton Nir. The Eton Nir Grotto is one of the many underground caverns that are found across the massif. Evermore, sometimes spelled Evermor, is a city on the banks of the Bjoulsae River in eastern High Rock, located near the border with Hammerfell. The city was founded in 1E 983, after the fall of Orsinium opened the Bjoulsae for trade and transport. Its impressive palace was assembled from slabs of granite quarried from nearby Markarth. Local traditions include the worship of Saint Pelin, a hero of the First Era who once served as a clergyman at Bangkorai Garrison. Historically, the Bretons of Evermore ruled over the region of Bangkorai. They faced constant harassment from the Reachmen of the mountains, who claimed the city as their birthright. Southern Bangkorai included the Fallen Wastes region of Hammerfell, and Evermore's rulership of it was often contested by the Redguards of Sentinel. In 2E 542, the city was sacked by a horde of Reachmen led by Durcorach the Black Drake after only a three day siege. It was retaken by Duke Blaise Guimard, who was later elected to the throne. After the Reachmen were defeated, Evermore, along with Daggerfall, Shornhelm, Camlorn and Wayrest, signed the first Daggerfall Covenant. In 2E 582, Evermore and its lands were again attacked by the Reachmen led by Uela. The Empire attempted to infiltrate the city in preparation for the arrival of the Seventh Legion, but Covenant agents were helped in preventing the city's treachery by Uela, who wanted to take Evermore for herself. Uela was ultimately killed before ever reaching the city, and the Seventh Legion's invasion was subsequently repelled. In the Third Era, the lands of Evermore became fragmented and the Fallen Wastes region was returned to Hammerfell. During the Imperial Simulacrum in the late Third Era, the city-state of Evermore was ruled by King Tristynak. It had a rivalry with North Point and the Imperial City. Evermore was neighbored by several settlements, including Black Wastes to the west, and Dunkarn Haven to the east. Before the Warp in the West, it was one of eight de jure kingdoms in High Rock. Following the Warp, Evermore's borders expanded drastically and it became one of the five remaining kingdoms in High Rock. Eyevea is a small island in the Abecean Sea, far west of mainland Tamriel. Geographically it is part of the Summerset Isles archipelago, although it is owned by the immortal Arch-Mage Shalidor of Skyrim, who bought it from the Altmer in exchange for some minor artifacts. In the early First Era, Shalidor established the island as a retreat and sanctuary for all mages. Altmeri architecture was used in the construction of the island's facilities, which included docks, workshops, bridges and halls. However, Shalidor traded Eyevea to the Daedric Prince Sheogorath for the Folium Discognitum, a tome of knowledge which he had been obsessed with obtaining. The island was duly spirited away to the Shivering Isles, where it would remain for thousands of years. It can be assumed that the island was therefore subjected to the Greymarch, possibly several times. [nb 1] Its time in the realm also seemingly resulted in the introduction of indigenous Mushroom Trees to the island. Shalidor went on to regret trading away the island, feeling that he had been tricked by the Mad God. In 2E 582, the Mages Guild was expelled from Cyrodiil and became fractured due to the Alliance War, despite claiming neutrality in the war. Although he had had nothing to do with the guild in life, Shalidor returned to the affairs of mortals in order to win back Eyevea from Sheogorath so that it could serve its original purpose and act as a sanctuary for the guild. Sheogorath agreed to give Shalidor the means of reclaiming the island, if his champion agreed to complete four trials for the Prince's amusement. An adept of the Mages Guild agreed to undertake the Trial of Eyevea, and was then subjected to various inane tests. At the end of each trial, the guild was given a tome containing clues to returning Eyevea to Mundus. Valaste, the guild's Master of Incunabula, took on the burden of decrypting these books, as Shalidor himself was forbidden to read them. The guild was eventually successful in restoring the island, but as a final test Sheogorath neglected to remove Eyevea's Daedric guardians before returning it. As such, it was swarming with Golden Saints and Dark Seducers, which needed to be cleared out. With that done, the adept was forced to fight Haskill to finally clear the island of Sheogorath's influence. The island was subsequently occupied by the Mages Guild, which opened portals in every guildhall in Tamriel to allow access. As well as acting as a center of magical learning, Eyevea also became home to a guild vault, and merchants were allowed to peddle their wares as long as they paid a tithe to the guild. War-related infighting proved to be a problem due to the diverse range of guild members the island attracted, although guildmaster Vanus Galerion took measures to prevent it. The island also contained legendary crafting sites, where items crafted would obtain certain innate magical traits due to the creative echoes of the original master crafters. This page was last modified on 17 April 2019, at 16:33.